The latest in the Tom Clancy branded games is the follow-up to HAWX, about the nearest thing to the Ace Combat series available on the PC. This version is focusing upon the DX11 tessellation function as its primary selling point, but the current version of the benchmark doesn't support this as an option. We often berate ports of console based games, and will do severely in a couple of pages time, for not taking full advantage of PC Hardware. However there is no denying that HAWX 2 is a stunning looking game. Even better it fairly flies (haha) along well above the 100 frames per second mark. Thanks to the amount of eye-candy going on both the "bigger" cards on test here, the GTX460 1GB and Radeon HD6870 pull ahead. 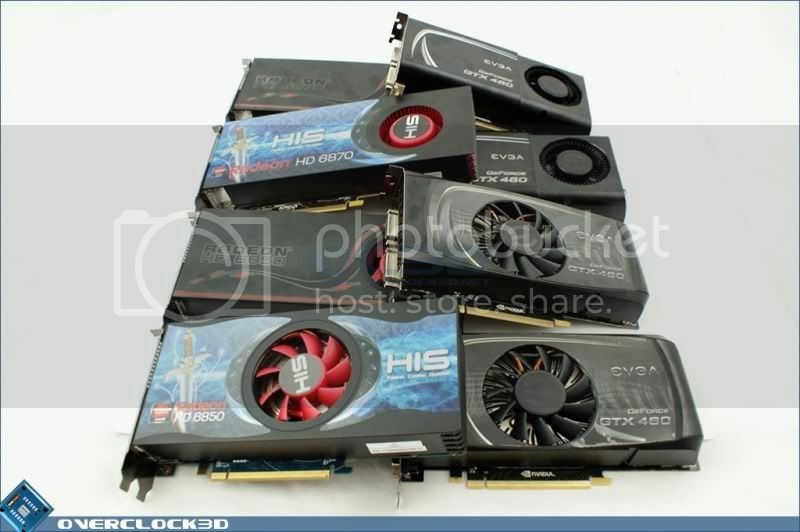 The 1GB GTX460 in particular has a strong lead, although all of the cards happily turn and burn. Moving away from flying puns and onto our overclocked tests we again find the 768MB GTX460 to be really responsive to the extra performance available from the overclock as it just edges ahead of the HD6870. Because of its roots as a console game, and therefore designed around a single GPU, HAWX 2 definitely doesn't make the most of a twin card setup. There is an improvement to be seen of course, but nowhere near some of the big gains we've seen on previous pages. The biggest winner is again the smaller GTX460 which started out at the back and just about overtakes its big brother here. 3 frames at these speeds isn't exactly anything to write home about, but it shows how little stress the Ubisoft game is putting on the cards. Although Tessellation is unavailable in this demo, we're pretty sure that it's on by default. With the cards overclocked both the nVidia options are well ahead of their Radeon counterparts and up around 300 FPS maximum, which is just ludicrous. You could probably run HAWX 2 in 3D on three 30" monitors and still happily fly along above 60FPS.